If you have noticed wood that sounds hollow, mud tubes on exterior walls, any cracked or bubbling paint or frass termite droppings then these are strong indicators that there is termite infestations. 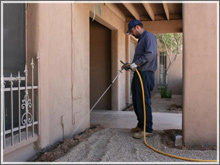 Termite infestation is difficult to detect as they work from inside to outside. Termites actually live hundreds of feet below the ground and form huge colonies. 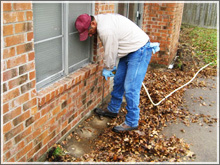 Ridding a home or a commercial building of termites requires special skills. At Chem-Pest during inspection we pin point specific termite attack zones where termites have entered or are likely to enter. Holes at suitable distance are drilled and termiticide solution is injected under pressure to create barriers against termites. Top floors if infested are given the same treatment. The holes on suitably sealed subsequently. Holes are drilled at the base of wooden fixtures such as winds frames, door frames and termiticide solution is injected. An oil-based termiticide is sprayed on all the wood work infested by the termites. Preventive treatment is carried out on other fixtures which are not infested. Termite tubes which are visible will be sprayed and removed and infested area will be treated with termiticide. Holes are drilled as close as possible to the plinth wall and termiticide is then injected so that it reaches the soil to eliminate the termites present there. Soil Surrounding the building will also be treated. At Chem-Pest we use highly effective odorless and colourless chemicals used in all developed countries. These are hassle free and safe for occupants and completely kill termites.